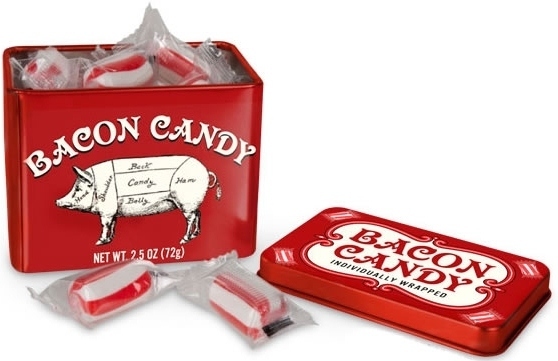 BECAUSE IT’S TASTIER THAN BACON AND THICKER THAN THREE-DAY OLD GRITS! That’s “Why should you read Steamfunk?” for a thousand dollars, Alex! While some might argue that nothing is tastier than bacon – Steamfunk is certainly tastier than turkey bacon and, without a doubt, is thicker than three-day old grits. Now, I would argue that Steamfunk is much tastier than bacon. Whether you agree or not, however, you must agree that Steamfunk and bacon share some uncanny similarities. 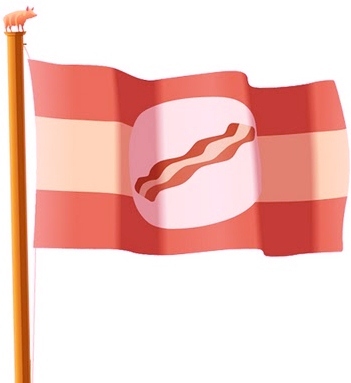 Why do we love bacon? According to a recent scientific study, it is due to the Maillard Reaction, a form of nonenzymatic browning, which results from a chemical reaction between an amino acid and a reducing sugar. This reaction produces a wide range of molecules that vary in flavor and smell and is what gives us the flavor of toasted bread, roasted coffee, chocolate, caramel and – of course – bacon. Bacon is made of mostly protein, water and fat. The protein is made up of the building blocks we call amino acids. The fat contains reducing sugars. Get that bacon really hot and the Maillard Reaction starts. And the smell of that sizzling bacon is enough to tempt even the staunchest of vegetarians. And somehow you know, dear vegetarians…there is something deeper going on inside that sizzling meat. There’s some complex chemistry going on. Well, the funky goodness that is Steamfunk occurs just like that bacon. 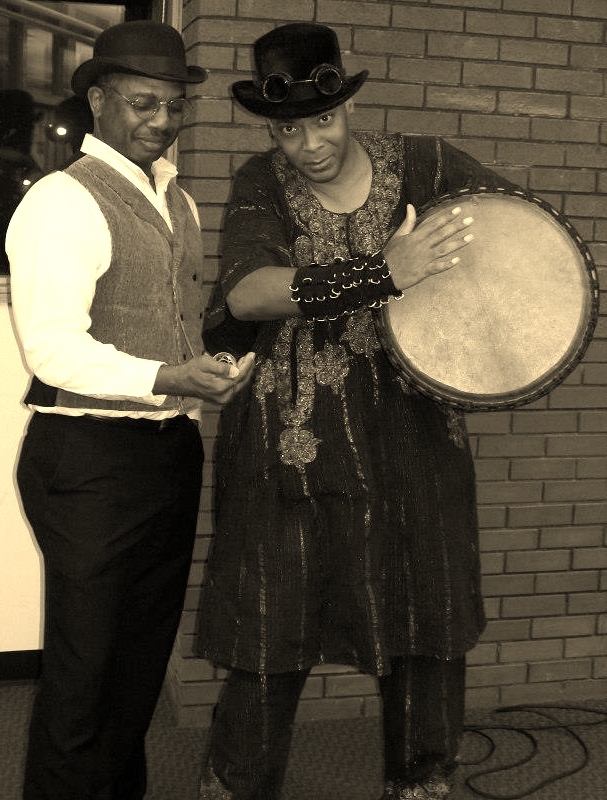 Scientists refer to the phenomenon as the Davis-Ojetade Reaction, a form of creativity and determination born out of a desire to see great Steampunk stories told from an African and African-American perspective (that includes both North and South America, by the way). I think that “Damn!” Was Milton’s way of saying “Oh, happy day,” or something to that effect. We then posted a call for submissions and received a surprising twenty-one – we didn’t know so many people were interested in telling Steamfunk stories. While all of the stories were incredible, we picked the twelve most funktastic ones and Milton and this author added a story each to this Blacknificent mix. 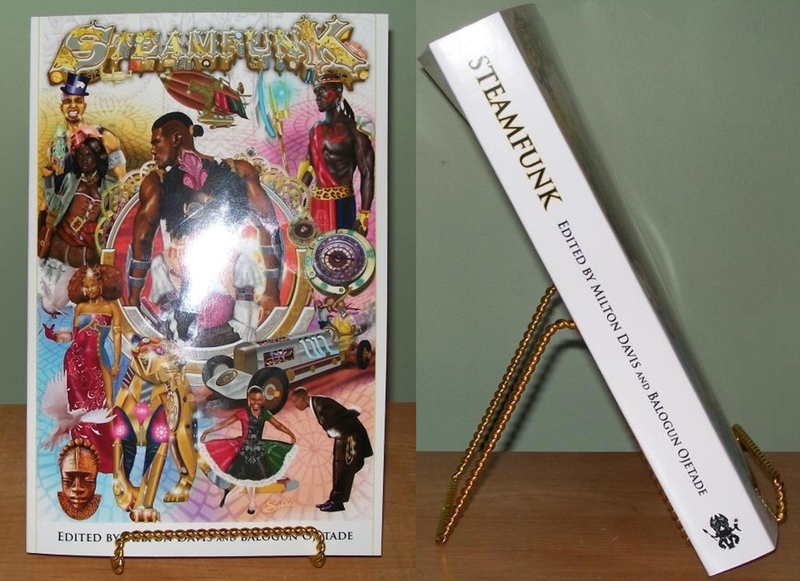 Marcellus Shane Jackson created some hot artwork and voila…Steamfunk was born. And somehow you know, dear reader…there is something deeper going on inside that sizzling cover. With such a diverse and talented group of authors, there is some complex chemistry going on. And the funk created by this thrilling anthology is enough to tempt the staunchest Steampunk and the most reluctant of readers. But taste for yourself. Pick up a paperback copy of Steamfunk, or grab one for your Kindle or Nook. You can thank me for all that funky goodness later. Milton Davis – Milton Davis is owner/publisher of MVmedia, LLC . As an author he specializes in science fiction and fantasy and is the author of ten novels, including Meji Book One, Meji Book Two and Changa’s Safari. Visit him: www.mvmediaatl.com andwww.wagadu.ning.com . Malon Edwards – Born and raised on the South Side of Chicago, Malon Edwards now lives in the Greater Toronto Area. Much of his speculative fiction features people of color and is set in his hometown. Malon can be reached at eastofmars.blogspot.com. Valjeanne Jeffers – is an editor and the author of the SF/fantasy novels: Mona Livelong: Paranormal Detective, Immortal, Immortal II: The Time of Legend and Immortal III: Stealer of Souls, Immortal IV: Collision of Worlds and The Switch: Clockwork. Visit her at: http://valjeanne.wordpress.com and www.vjeffersandqveal.com. Balogun Ojetade – Author of the bestselling Afrikan Martial Arts: Discovering the Warrior Within (non-fiction), and seven novels in the Action / Adventure, Steamfunk, Sword and Soul and Urban Fantasy genres and screenwriter / director of the films, A Single Link and Rite of Passage. Finally, he is co-writer of the award winning screenplay, Ngolo and co-author of Ki-Khanga: The Sword and Soul Anthology and co-editor of Steamfunk! Visit him: https://chroniclesofharriet.com/ and https://www.roaringlionsproductions.com/. Geoffrey Thorne – Geoffrey Thorne has written a lot of stuff in a lot of venues and will be writing more in more. It’s his distinct pleasure to take part in another of these groundbreaking anthologies. Thanks for letting me roll with you folks. For more (and God knows why you’d want more) check out http://www.geoffreythorne.com/. Posted by Balogun on February 26, 2013 in Adventure, Afrofuturism, atlanta, Dark Fantasy, Fantasy, Harriet Tubman, Historical Fiction, Science Fiction, Short Story, Speculative Fiction, Steampunk and tagged bacon, steamfunk, steampunk. So you heard me? Damn…I mean…nevermind. I wish for the best in sales to Steamfunk!, both in digital and print! Read the first two stories so far. Brilliant stuff. I finished Ki-Khanga: The Anthology before that. I’m so looking forward to the game! I am glad you are enjoying Steamfunk!, Fujimoto! I am so looking forwrd to Ki-Khanga: The Sword and Soul RPG’s release myself. We are getting close! You’re welcome! Is there an estimated release date yet, or is it still being decided on? We have commissioned another artist whose amazing Sword & Soul work we just HAD to include. So, we project a late 2013, or an early 2014 release. Ah, good then! Will it be distributed from sites like Drive Thru RPG? You’re so funny, I swear! Great post.